Two trunks up for all of these gifts. 1. 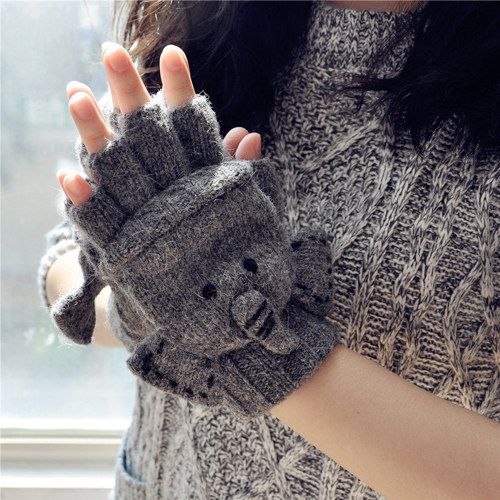 A cute pair of knit elephant gloves that you can button close to keep your fingers warm. 2. A plastic elephant holder that drains water from just-washed silverware or toothbrushes into a sink. 3. A ceramic dry erase memo elephant — that does include a black marker — to help keep track of your most important tasks for the day. 4. 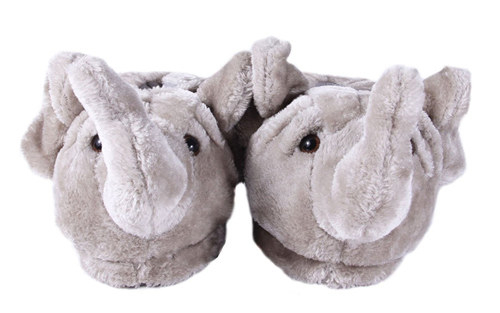 A pair of plush Happy Feet elephant slippers that will definitely be a lounging must-have. Get them from Amazon for $15.99+. Available in men’s sizes S–XXL, women's sizes S–XXL, and toddlers' sizes 7.5–12. 5. 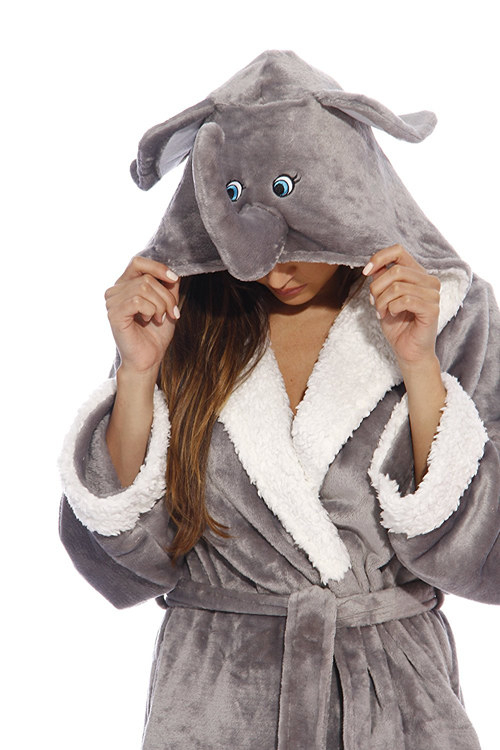 And a cozy elephant robe to match your slippers. 6. 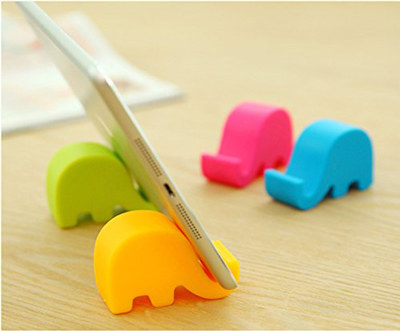 A pack of colorful cartoon elephant phone stands you can use to free your hands while watching TV or movies on your phone or tablet. 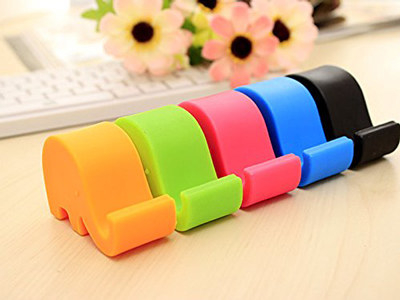 The set includes an orange, green, pink, blue, and black elephant stand. Get a five-pack from Amazon for $6.78. 7. 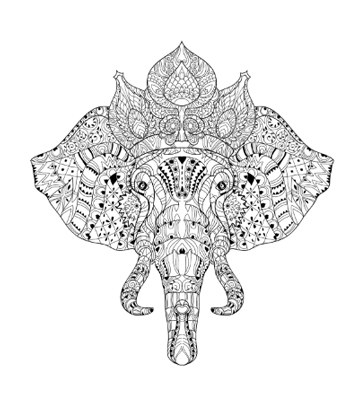 A darling metal elephant wind chime that will look elegant hanging inside or outside your home. Get it from Wayfair for $15.99. 8. An pack of elephant-shaped mini soaps that you can use as party favors or an unexpected decoration in your bathroom. Get an eight-pack from Love Lee Soaps for $6. 9. 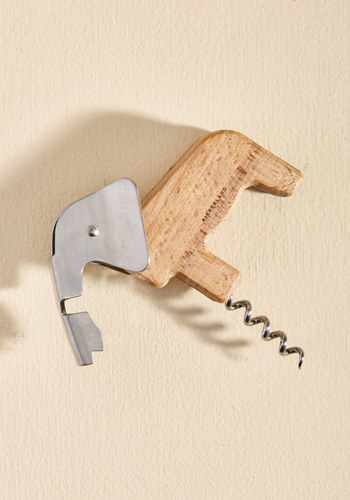 A stainless steel and beechwood elephant corkscrew. 10. 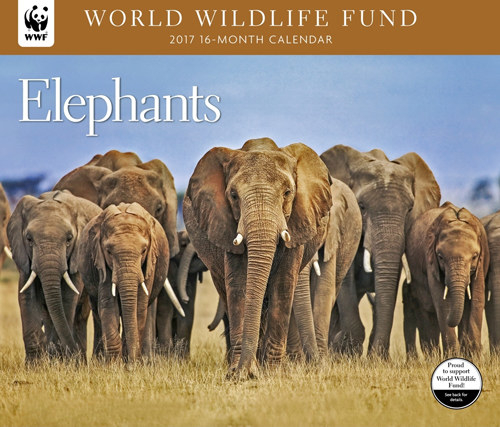 A beautiful World Wildlife Fund elephant calendar that will teach you new elephant facts each month. 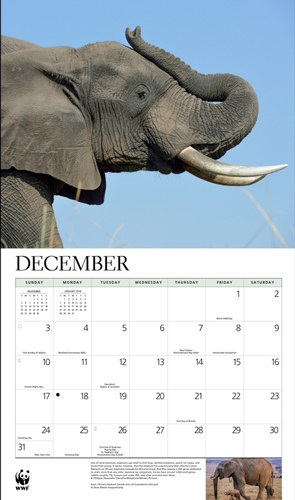 Get it from Calendars.com for $14.99. 11. An adorable minimalist print that any Dumbo fan will adore. Get it from Tints Shades Fine Art on Etsy for $15+. Available in 5 sizes and three border-size options. 12. A luxurious geometric elephant lamp that will be the talk of any room. Get it from Pottery Barn Kids for $49. Available in two colors. 13. A set of pink elephant sticky notes and page markers that will keep you organized in the cutest way. Get the set from Amazon for $5. 14. A shower curtain with a drawing of a smiling elephant spraying out a colorful bouquet of flowers from his trunk. 15. 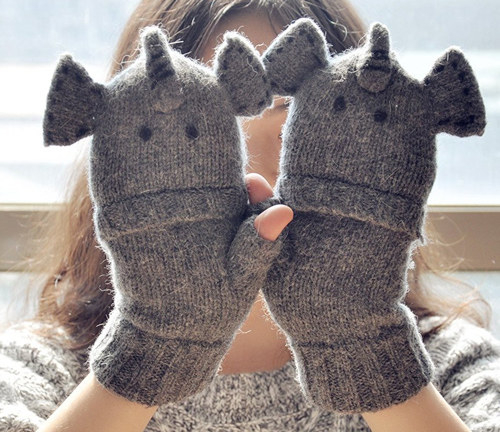 A pack of wool elephant socks to keep your toes toasty. 16. 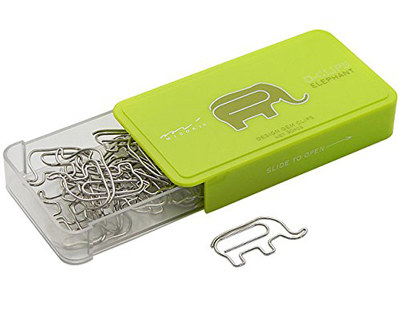 A pack of elephant paperclips that come in a bright green case. Get the 30-pack from Amazon for $7.07. 17. 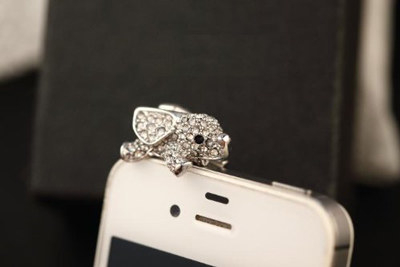 A sweet crystal elephant plug you can use to keep your earphone jack free of unwanted dust. Get it from Amazon for $1.19. 18. 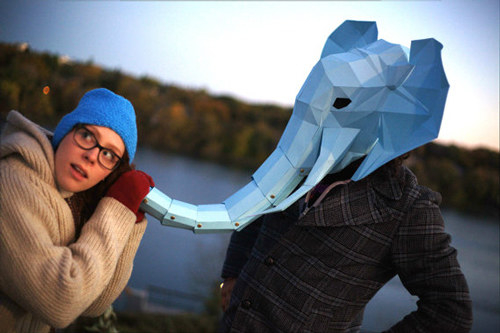 An elephant wine holder made from veneered plywood that will have all your guests talking. Get it from Wood Ko on Etsy for $24. 19. 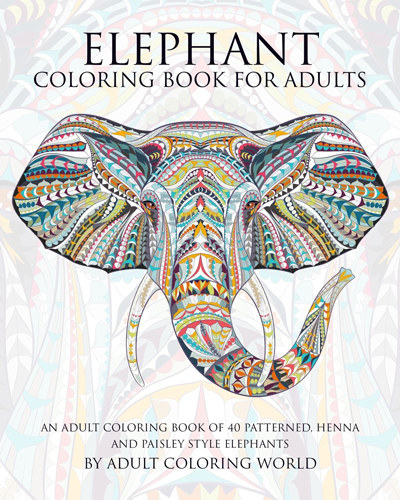 An elephant adult coloring book that includes 40 intricately patterned, henna, and paisley elephant designs. 20. A lovely set of wooden coasters with hand-carved elephants on them. The the set of four from Amazon for $12.99. 21. 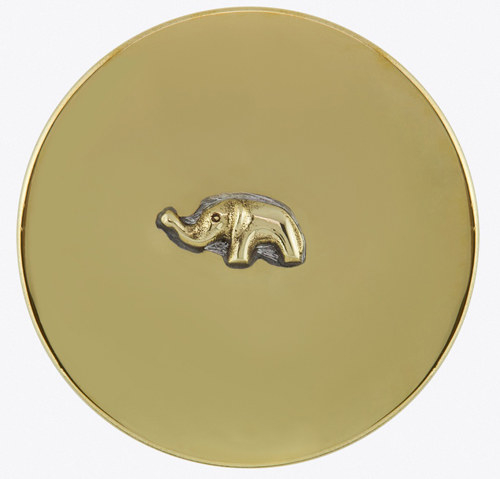 A gold-and-cream analog elephant watch that will become any fashion lover's go-to accessory. 22. A pretty pair of gold elephant bookends to dress up your bookshelf. Get the set from Nordstrom for $40. 23. 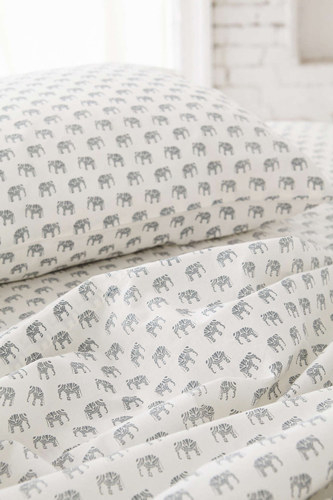 A throw pillow that features one extremely wise-looking pachyderm. Get it from Wayfair for $39.99. 24. A wood-and-zinc metal wall rack with five elephants whose trunks you can use to hang items on. Get it from World Market for $29.99. 25. 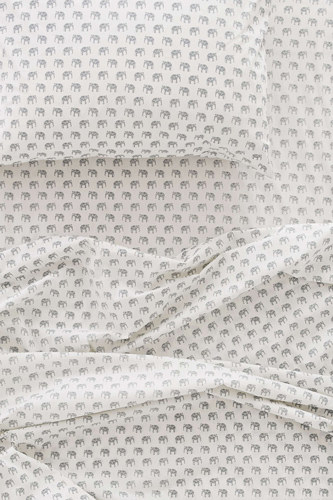 A magical set of sheets and pillowcases that feature a minimal elephant print. Get the flat sheet from Urban Outfitters for $29+. Available in sizes twin XL, full, queen, and king. Get the fitted sheet for $29+. Available in sizes twin XL, full, queen, and king. Get the set of two pillow cases for $29. 26. 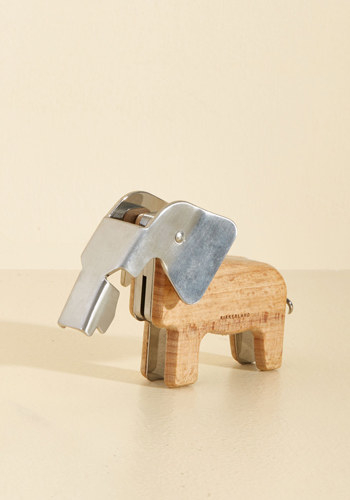 An elephant document organizer that looks like it should be in an art museum. Get it from Wayfair for $19.99. 27. A gleaming anagram elephant ring holder made from copper. Get it from Wayfair for $10.99. 28. An awww-worthy humidifier that will brighten your face while adding a little extra moisture to your room. The humidifier includes a removable one-gallon tank that fits under most sinks to refill it. 29. 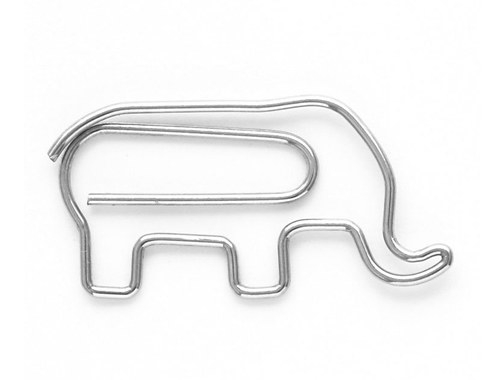 A tri-tone elephant barrette to add a stylish touch to your hair. Get it from Pins With Personality on Etsy for $24. 30. 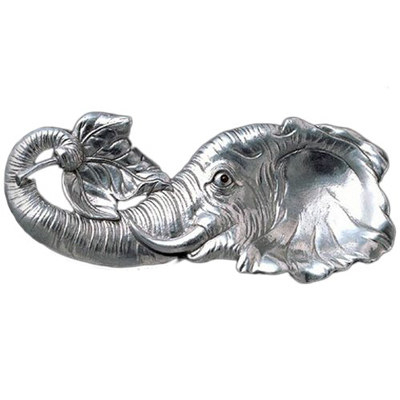 An antique silver elephant pen holder to give a subtle nod to the majestic animal. Get it from Brookstone for $39.99. 31. A gold elephant bracelet that you can personalize with an initial. Get it from Ellies Button on Etsy for $14+. Available in four colors. 32. A set of elephant shakers with interlocked trunks you can use for salt and pepper or other spices. Get the set from Modcloth for $14.99. 33. A glamorous pair of navy C. Wonder suede elephant loafers. Get them from QVC for $79.96. 34. A black and white elephant sweatshirt that will be a whimsical addition to any outfit. Get it from Forever 21 for $17.90 Available in men’s sizes XS–XL. 35. 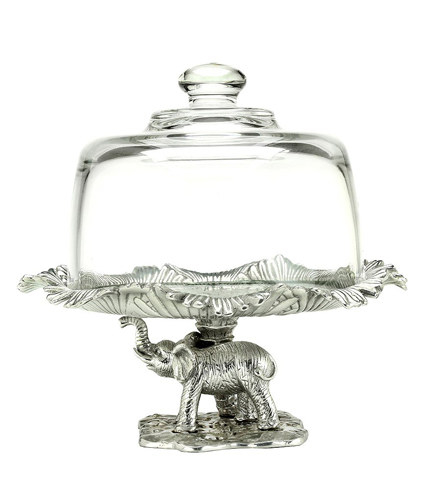 A glass and aluminum elephant cake plate or silver spoon rest to bring some extra good luck to your next dinner party. Get the cake plate from Dillard’s for $65. Get the spoon rest from Amazon for $28. 36. 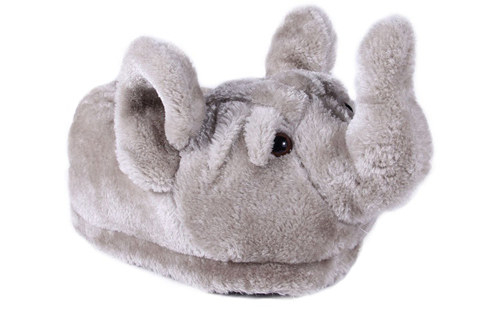 A super-cuddly elephant bean bag chair that comes with a matching mini elephant toy. Get it from Amazon for $33.96 or Wayfair for $51. 37. A sweet two-tone elephant necklace that is perfect for a new mommy. Get it from Else Jewelry on Etsy for $27.99+. 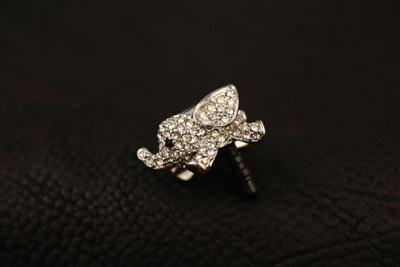 Available in two elephant sizes you can get in three metal colors and two chain colors that come in four lengths. 38. A colorful rubberwood puzzle that will keep any little one entertained. Get it from Nordstrom for $11.99. 39. 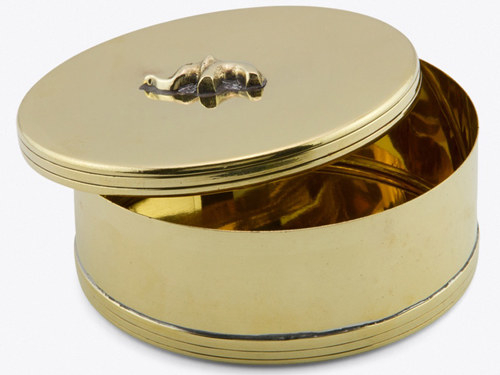 A recycled-brass elephant trinket box to store necklaces, rings, or other tiny items. Get it from FY for $43. 40. The books An Elephant's Life: An Intimate Portrait From Africa or African Elephants: A Celebration of Majesty, which are both packed with breathtaking images of the beautiful animals. Get An Elephant's Life: An Intimate Portrait From Africa on Amazon for $5.10. Get Elephants: A Celebration of Majesty from Amazon for $7.83. 41. A dishwasher-safe elephant teapot that will be a welcome guest at tea time. Get it from Pier 1 Imports for $14.98. 42. 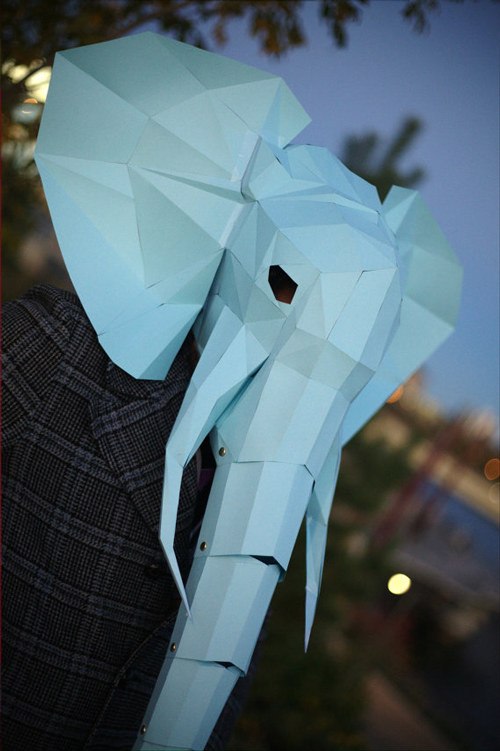 And an epic DIY paper elephant mask template that you can download instantly to take on the challenge of folding your own pachyderm masterpiece. Get it from RPS Creations on Etsy for $9.90. To make the mask from the template, you will need a printer, tape, round head fasteners, paper, and scissors. Want more? Check out all of our 2016 gift guides here!